The Old Feed Store at 310 West Water Street in Woodbury, bested their previous mark for bags of feed sold in one month as they sold 3,000 bags in the month of April. "I am proud of our feed room staff... they work very hard to provide excellent service for every customer that comes through the door. They are knowledgeable and know how to determine the best feed for your livestock or pet," owner Michael Vaughn said. The Old Feed Store enjoys providing quality fresh feed for our community and getting to know our customers. 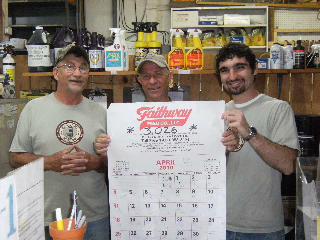 Stop by and see Charlie, Lee, and Jacob soon. Our store hours are M-F 9-5 Sat. 8-5 Sun. 1-5.